MIUI 8.0.6.0 Global Stable ROM OTA update is now available for the Xiaomi Redmi Note 3 users. The new ROM is based on the Android Lollipop and comes with some new bug fixes. Here in this tutorial, we will guide you how to update your phone with Latest MIUI 8.0.6.0 Global Stable ROM for Redmi Note 3. This update will be available for some random users, and you can get the download link of the MIUI 8 update from here flash the same on your phone with the update applications of your phone. The new update is MIUI 8.0.6.0 and rolled out via OTA (over-the-air) and is about 73MB in size, to apply this update on your Redmi Note 3, your phone should be run on the MIUI 8.0.5.0 global stable version. 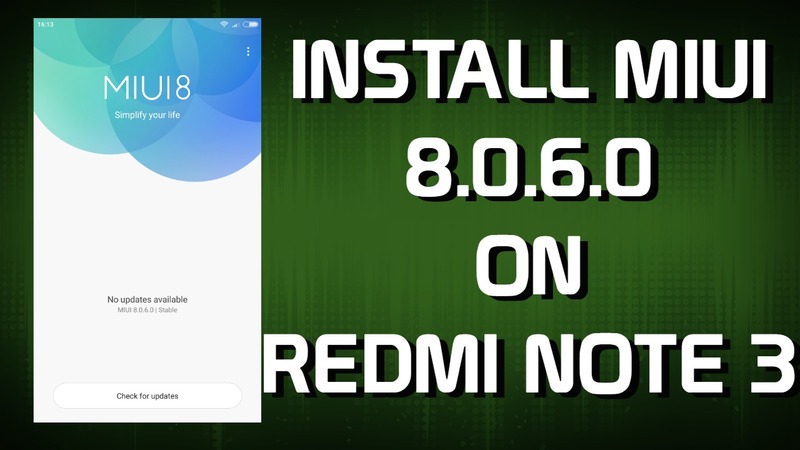 If you are on some other ROM then first flash the MIUI 8.0.5.0 and after that follow this method to download and install MIUI 8.0.6.0 OTA update On Redmi Note 3. Here we provide you the OTA for MIUI 8.0.6.0 Global Stable ROM for Redmi Note 3. Download the same from the below mention link and save it on your phone. Read all the instruction very carefully and follow all the steps one by one on your phone. So without wasting your time, let us get started and apply this new MIUI 8.0.6.0 Global Stable ROM OTA update on Xiaomi Redmi Note 3. Visit the below mention link and download the zip file of the latest Global stable MIUI 8.0.6.0 OTA update file. And save the zip file on your phone and Remeber the location of the file. And follow the below mention process to update your Redmi Note 3. 1. Save the OTA zip file on your phone first. 2. Now open the update application on your phone. Make sure your phone is running on the MIUI 8.0.5.0 to apply this update. 6. Now your phone will boot, and you will see the updating process will start on your phone, and this will take some time near about 5 to 10 minute, So be patience. 7. Once the process is completed, your phone will reboot and you are running on the latest MIUI 8.0.6.0 version. Enjoy! The new ROM on your Remi Note 3. So this way you can easily install the MIUI 8.0.6.0 on your Redmi Note 3. I’m using redmi note 3 with miui 7.5.3 and i received an ota update for miui 8.0.6 of 1.2 gb size.. so will there be any problem if i install it directly? ?